This soup has a fresh basil flavour that goes so well with the vibrant springtime green colour! I made a meal out of it by serving with a quick bruschetta and boiled artichokes with a lemony dipping sauce. In a large soup pot, boil fiddleheads in lightly salted water for 10 minutes. Drain, rinse and set aside. In the same pot (now empty), heat oil and add leeks, cooking over low heat until softened, but do not brown. Stir in flour and nutmeg. Cook for 2 minutes over low heat. Gradually, whisk in stock. Reserve 3 fiddleheads and add the rest to the soup along with parsnips and celery. Bring to boil, stirring, over medium heat. Reduce heat, cover and simmer 15-20 minutes. Meanwhile, saute reserved fiddleheads in a bit of olive oil until tender. Season with salt. Next, make basil oil by blending together the basil leaves with 1/2 cup olive oil until smooth. Alternately you can use prepared pesto. By now the soup should be ready. Puree the soup with rice milk, in batches in a blender, or with a hand-held right in the pot. (If you like you can add a small handful of chopped fresh basil and/or 2 tablespoons of plain yogurt while pureeing -- I did both for extra creaminess and more basil burst!) For a chunky soup, puree only the fiddleheads in enough soup and stir into remaining turnips and celery. Return to the pot, reheat and season to taste (may not need much salt depending on stock used). 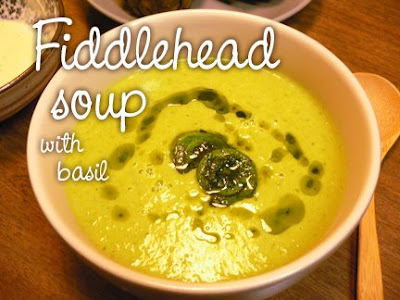 Ladle into soup bowls and garnish with sauteed fiddleheads and a drizzle of basil oil or pesto. Serves 3. I don't know the Ayurvedic assessment of fiddleheads but would venture to guess that, since they're so much like asparagus, perhaps they're tridoshic and therefore good for everyone to eat. Generally Vatas should add digestive spices and heaviness through additional ghee or yogurt in the recipes; Pittas should avoid pungent spices and minimize salt; Kaphas should minimize oils and salt. NB: The thorough washing and pre-boiling of the fiddleheads is a recommended measure to make sure there are no bacteria in these wild plants, which sometimes are present due to the unique nature of their cultivation. I saw some fresh fiddleheads at Sobeys the other day..this looks like a good one to try. thanks Fran. Hmm..this looks so comforting,nice recipe. Hey please vote for My (Hetal's) Veggie toast recipe which is my entry for the Kids Friendly cooking event hosted by Great Cooks ccounty fair.I would love to see u become a member of this community.